We are running a little over time for our March Newsletter. With all the things that have been going on during March our volunteers have been run ragged. We are busily working on the April Newsletter, and hope to have that out in time for April. Hopefully, in the meantime, no-one got caught with any April Fool's Pranks. Here's the best one we've seen so far this year. The Annual General Meeting of members, held on Wednesday 9th March 2016, was a huge success. Extra spaces were required at the hotel to accommodate the attendees and the food was all devoured before the AGM! We had a great talk with the trainers from Waterloo-Wellington Flight Centre about drone use for commercial purposes and the requirement to have an Special Flight Operation Certificate (SFOC) before each Home Inspection. Judging from the lack of response from Transport Canada from calls placed following the meeting, Mark from Eye-Stick, who was also in attendance may be doing a lot of business. Trish Peden from Safety Express and Jeffrey Bartell from FLIR discussed the new InfraRed moisture detection technologies and processes as well as how to circumnavigate the Working at Heights regulations while keeping yourself safe and legal. Gemil Lacroix of Nusite explained methods used to identify sources of leaks in the basement, and methods of repair and recommendations inspectors can safely make were explained. Rod Joseph from InspectR discussed a new service on offer that may help inspectors reduce their ongoing operational costs. You can read more, and watch the recordings on the members only section of the website. The Keynote Speaker was Mr Han Dong, MPP for Trinity-Spadina. Mr Dong attended at the end of the conference and just before the AGM and presented a briefing on his Private Members Bill-165, an Act to regulate Home Inspectors, and explained the expected process of moving the Bill to Law. Hans briefing was well received, with enthusiastic support for his initiative from the attendees. We look forward to hearing more from the government on the progress of this initiative. As we told you last month, many members who obtained the CCHI are now coming up on their 2 year re-confirmation period. 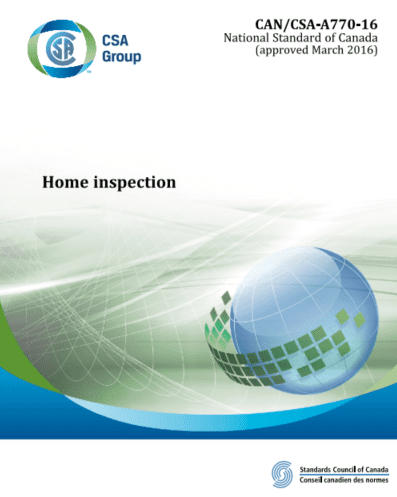 With Bill 165, Licensed Home Inspectors Act, 2016 proceeding through the Ontario Assembly, we expect to soon be asked to provide details to the regulator about the certification process, and our audit functions. It is more important than ever for you to keep your CCHI current by completing your Continued Professional Development and Continued Professional Education logs. This includes ensuring you have uploaded documentary evidence of this education, and notifying the certification committee if you have problems. Remember, you must also make the affirmation no changes to your Criminal Background check have been made and your current professional liability insurance certificate is uploaded and current. You can perform all this through the members only link on the web services portal at http://www.ontarioachi.ca. Remember you have to log in to get the members only links and pages. If you let your CCHI lapse, then we will not be able to put you forward for transitioning into any new License scheme. CAN-CSA-A770-16 has finally been release to mixed reception. Having now had a chance to read through the final release of the document (available for sale at the CSA shop) we are confident that the OntarioACHI Residential SoP already exceeds the requirements of the CSA publication. There are a couple of extra requirements in the CSA document which go outside the scope of the OntarioACHI Residential SoP and we will be working to release an update to ensure our members are fully compliant with, and exceed the expectations of this new standard. Unlike the CAN/CSA-A770-16 standard, which will cost clients $50 to obtain a copy, the OntarioACHI Residential SoP will remain open-source, under a creative commons license, allowing you to incorporate it in your agreements and reports at no extra cost to you or your clients.